Hello, I am a 47 yr old grandmother from Phoenix Arizona. I collect creepy dolls. I have a massive collection of Living Dead Dolls. 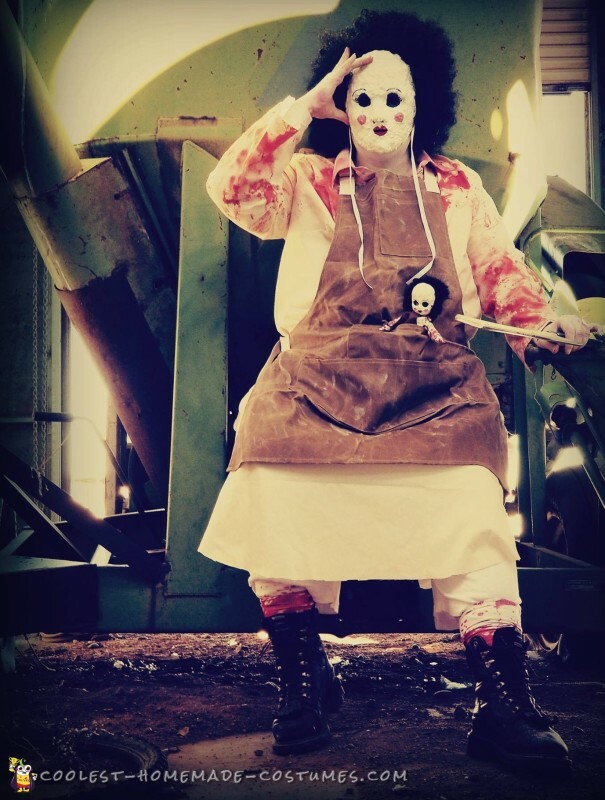 One of the dolls from Series 32 is named Butcher Boop. She has a fantastic look and I knew I wanted to be her for Halloween this year. 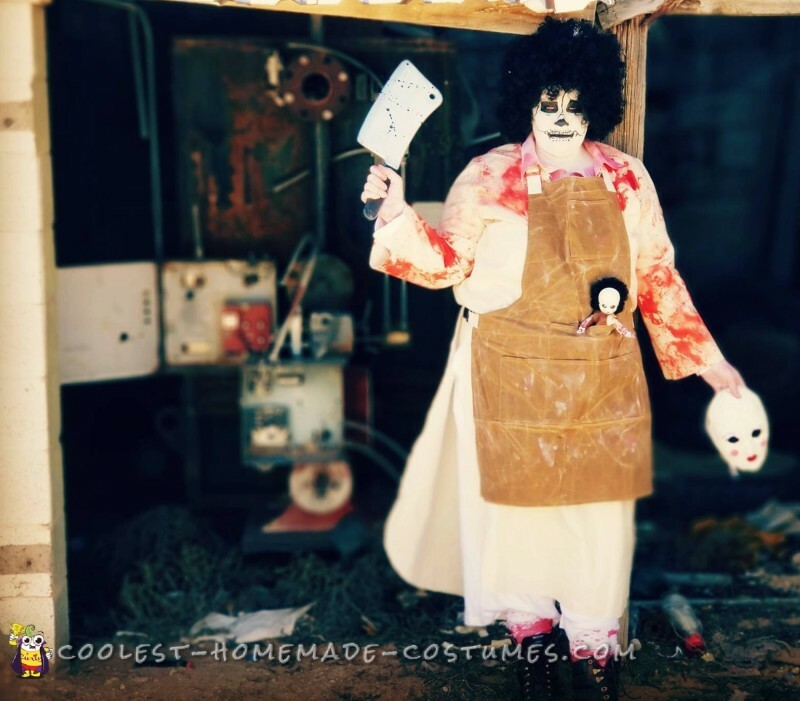 She is reminiscent of “Leatherface,” and I wanted to put my own spin on it. Also, she comes from a family of cannibal butchers. She has a skeleton face because she butchered off her own face and ate it. She tried to construct a new face and be a “Beauty Queen,” but her new face is creepy and disturbing. 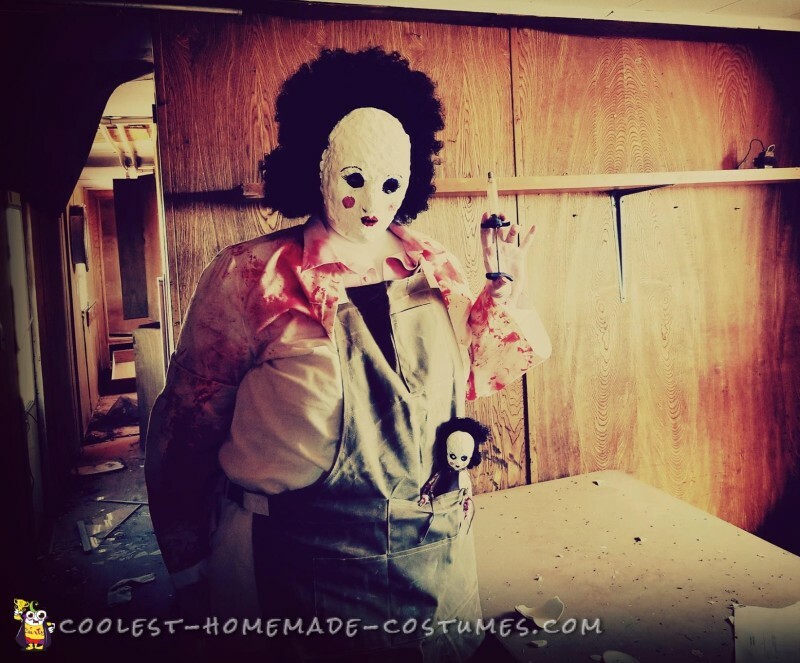 I have been constructing this Living Dead Doll costume for about a month. 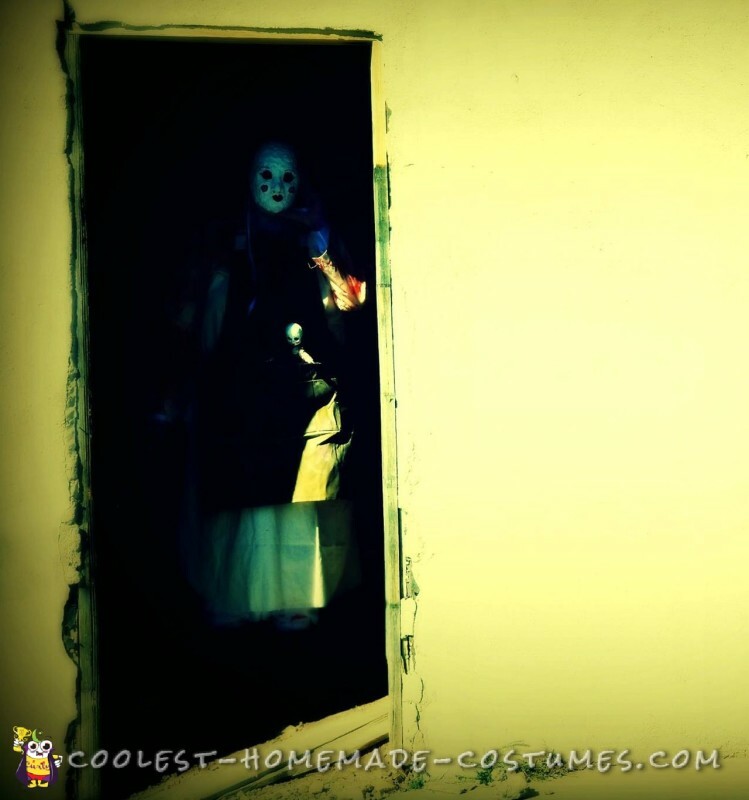 I didn’t know how to sew, so I took some classes to learn how to make this costume. 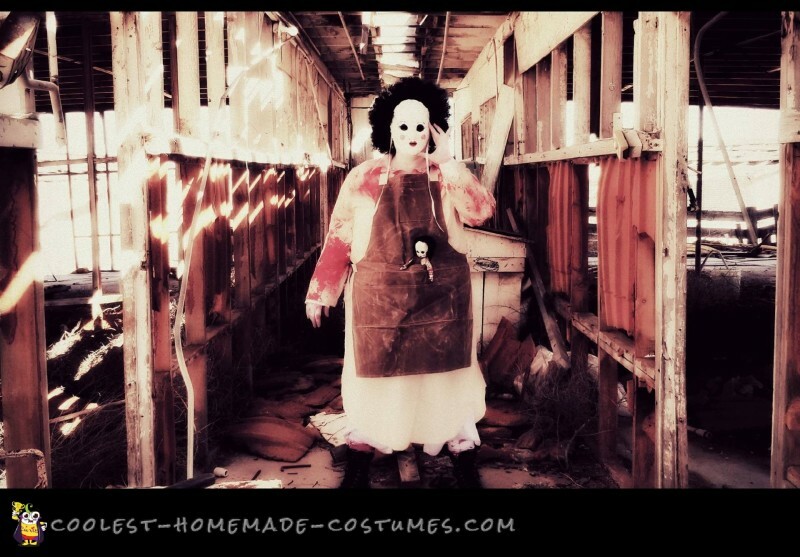 Using a Simplicity pattern, I hand sewn the dress out of linen and splattered with stage blood. The mask is made of paper mache using a mold of my face and painted with acrylic paints. I used premade paper mache mix to get the bumpy look I was after. 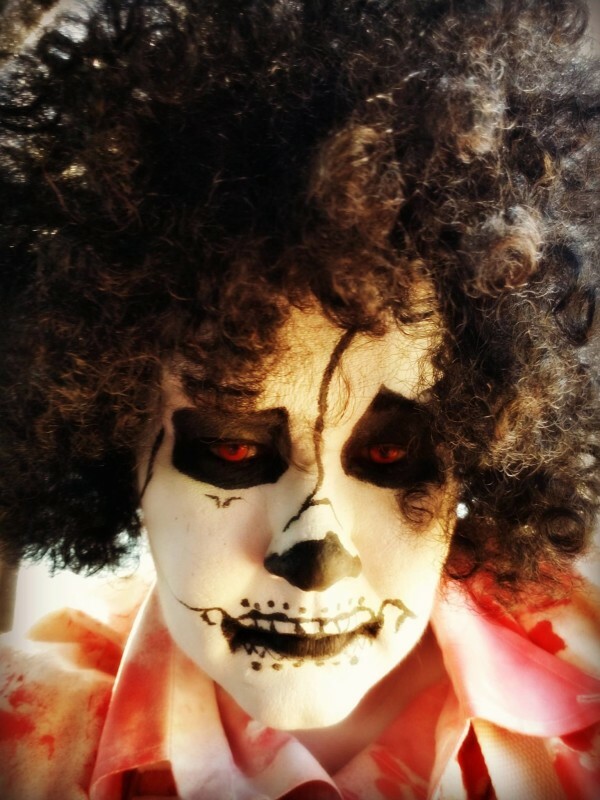 I did all the makeup using Mehron clown paints. The contacts are “red vampire” contacts I bought online, The hair came from the Spirit Halloween store. 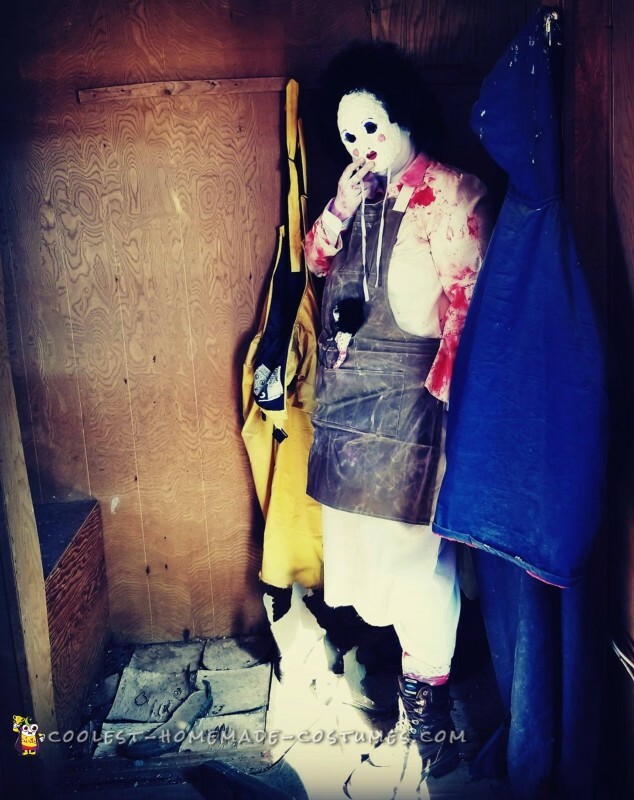 I had a really fun time putting the costume on in a barn! We are building a house in the area and the barn is the only standing building as we are still working on the house. We finally have the roof on though! Yay! 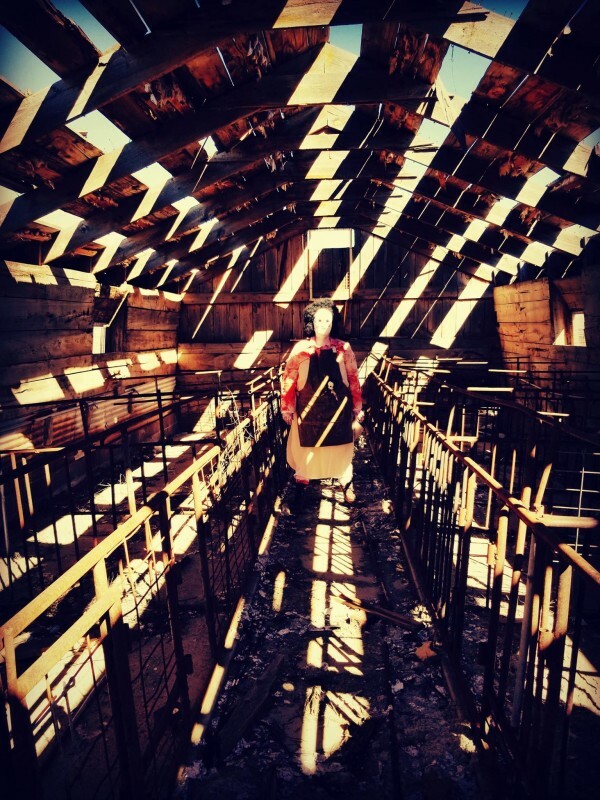 The pictures were taken at an abandoned pig farm in Snowflake Arizona along with some abandoned mobile homes on the property. The atmosphere of the location was eerie and had its own sort of beauty. It was quiet but there was a slight breeze which made all the metal squeak, which added to the ambiance of the shoot. 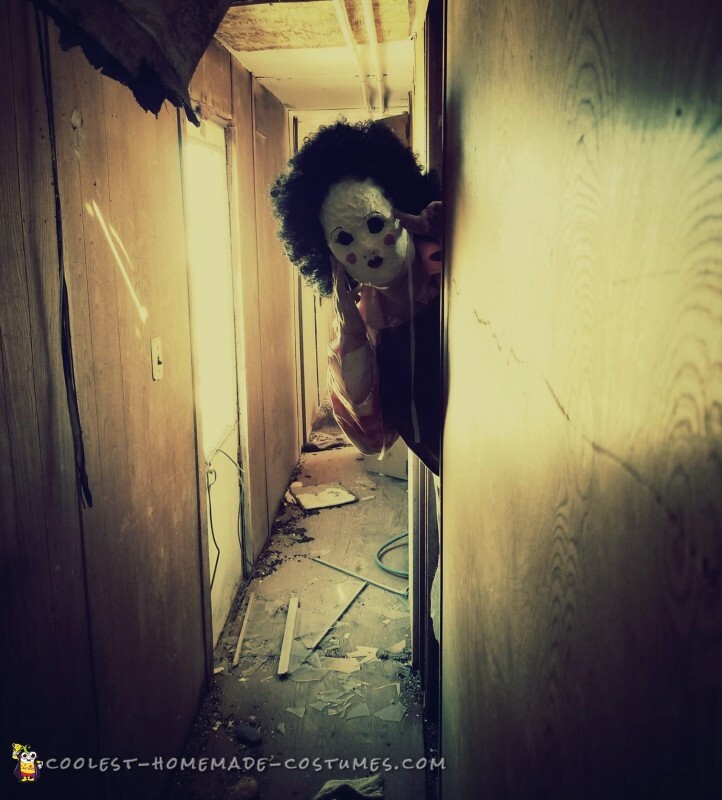 The pictures were taken by a family member and I feel lucky that my family accepts my love for creepy things. They are very supportive. The reactions I have received for this costume range from shocked to horrified to admiration. I love this costume and seeing the looks on people’s faces when I am wearing it. A funny reaction I got was when we were driving to the location. There are a lot of narrow dirt roads in the area that we had to take. There was a truck coming the other way on the narrow road, so we had to pull to the side to let the truck pass. They stopped and rolled down their window to give a country “Thanks!” and I was sitting in the front passenger seat dressed in full costume. I leaned forward to wave and the driver of the truck jumped and said “Oh my Lord!” and then laughed. I scared the poor guy and his family. I hope you enjoy the costume and my efforts! 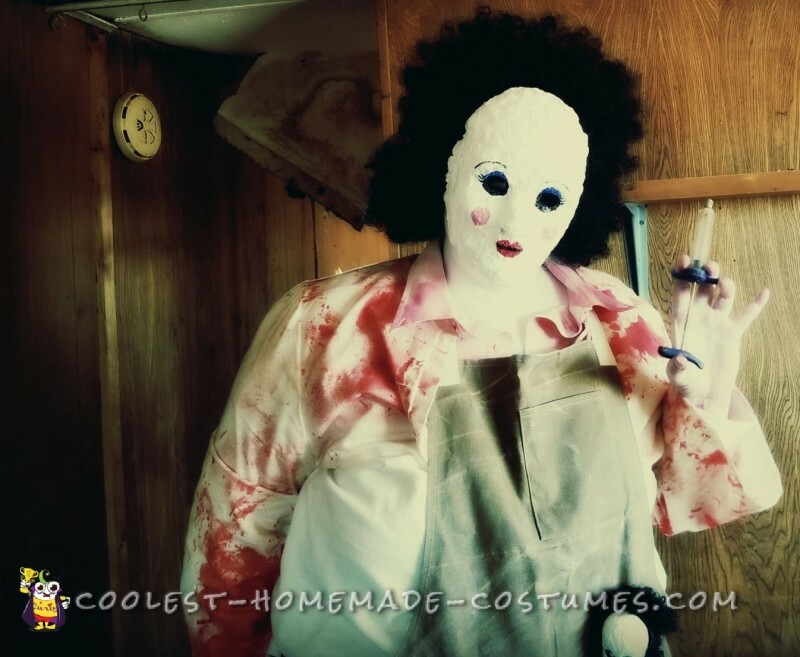 I am having so much fun with this Living Dead Doll costume. Thank you for your time and Happy Halloween! !